We started the week in wild and wacky colours to raise money for CAFOD and end it having taken part in the Stations of the Cross at Oaklands chapel to shepherd in the Easter holidays. We wish you a happy Easter celebration with your family and friends. 4S: Maddie Gissing: ‘For using the gifts God has given her to be a thoughtful, bubbly and enthusiastic member of the class’. 4S: James Watson for challenging himself with his problem solving and reasoning in Maths. 4B: Emily Long for gaining confidence with problem solving. First week back after Easter holidays – whole school Penny Drive – bring in spare pennies for CAFOD. We have given the children a list of creative tasks for the Anglo Saxons/Vikings that they can do over the holidays. If they have another history project in mind then they are welcome to bring in for the first week back after the holidays. We hope you have a lovely break. In English this week, we have written and edited letters to Jemmy Button. 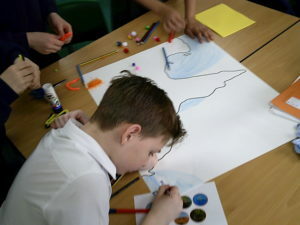 The children have been using different techniques to give reason why Jemmy should stay in London and why he should return to his island. They wrote letters with a balanced argument, leaving the final decision up to Jemmy. In Maths we have begun our multiplication and division topic. We have used the grid method and formal written method to solve multiplication questions. We will be continuing this next week. Please continue to encourage your child to take part in Sumdog challenges. This is a fun way for the children to practice their skills. 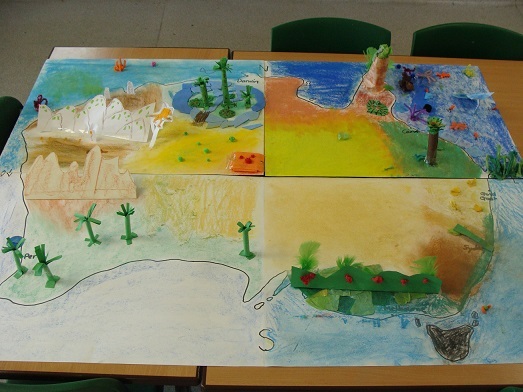 We had our Geography day today. 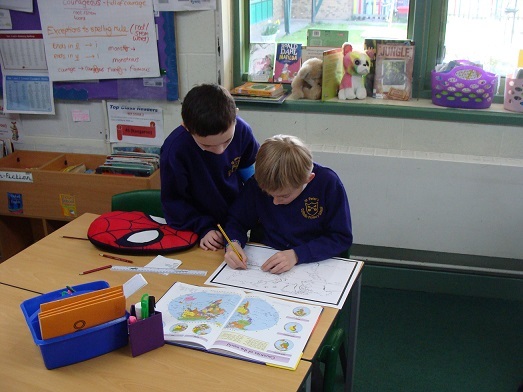 Year 4 were developing their map skills. We used geographical language to help us find countries on a map. We then focused on Australia, where the children created a ‘jigsaw’ map which show the different landscapes within the country. Monday 1st April – Wear it wacky for CAFOD. Friday 5th April – INSET day, the school will be closed to the children. Home learning expectations are 10 minutes per day each on a Reading, Spelling and Maths activity. This needs to be updated each day in the home learning diary and this is checked on a Thursday. We hope you have a lovely week. 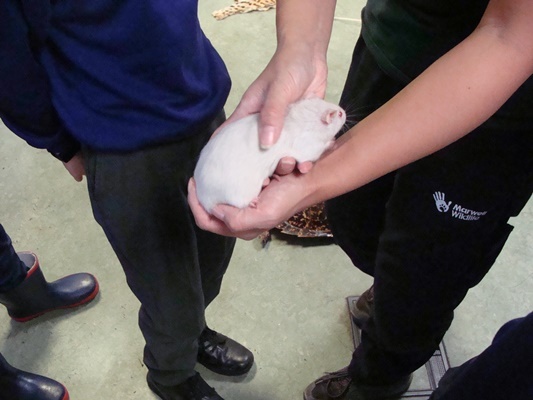 We end the week with our Heads up for Guide Dogs day, which was well supported by the whole of St Peter’s. 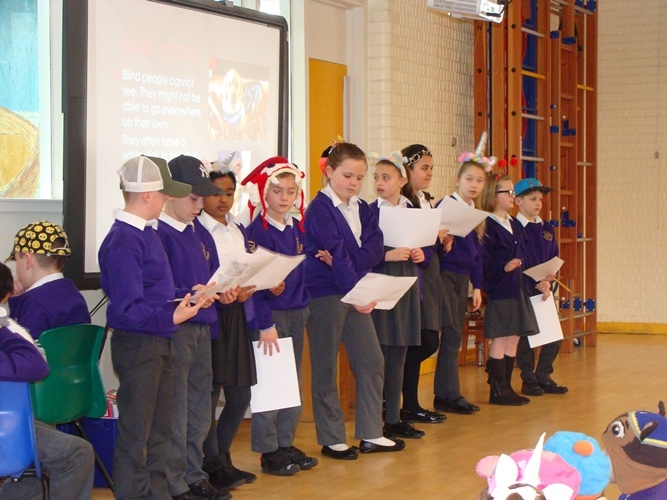 Year 4 led a whole school assembly to inform the children about the benefits of a blind person have a guide dog, training from pup to dog and what the fundraising money can be spent on. A big thank you for your support in this cause and we will update you with our fundraising total in due course. In English this week, we have continued our topic exploring the book ‘Jemmy Button’. The children wrote persuasive sentences to Jemmy, which have included a variety of different connectives/conjunctions – our grammar learning this week. They then had a chance to role play their persuasive piece from either a bias or balanced viewpoint. This verbal rehearsal will lead into writing to Jemmy next week. Please continue to encourage your children to take part in the reading challenge; the prize for completing the reading challenge and being drawn from the hat on Friday 22nd March is a trip to Rock Up in Whiteley. In Maths we continue our addition and subtraction topic. This week have been focusing on subtraction using a variety of practical resources to support the written methods, which include exchanging. Please support your child with securing their times table knowledge. Challenges are set on Sumdog as homework and all children are expected to take part. If your child has lost their log-in, we are more than happy to provide another copy. Wednesday 20th March – Deadline for the Spring Reading Challenge. Children to hand in the booklet to their class teacher. In English this week, we have continued our topic exploring the book Jemmy Button. The children wrote diary entries as Jemmy which have included complex sentences – our grammar learning this week. We will continue this into next week. In Maths we have begun our addition and subtraction topic. This week have been focusing on addition using a variety of practical resources to support the written methods. We are moving on to subtraction next week. Please support your child with securing their times table knowledge. Challenges are set on Sumdog as homework and all children are expected to take part. If your child has lost their log-in, we are more than happy to provide another copy. It was lovely to see so many different book characters on Thursday. Please continue to encourage your children to take part in the reading challenge; the prize for completing the reading challenge and being drawn from the hat is a trip to Rock Up in Whiteley which the children are very excited about. Our soggy end to the week brought a trip to Marwell. 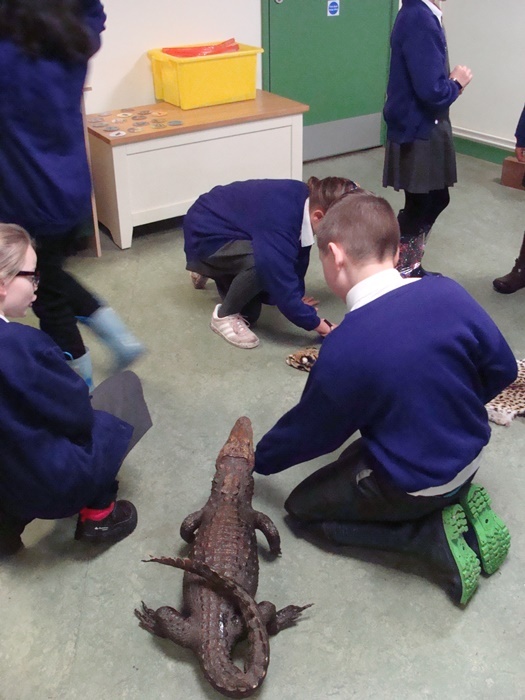 The children enjoyed a workshop about the different types of animals at Marwell and how they adapt to their habitats in the wild as well as considering how certain species become endangered. The children were introduced up-close to a hissing cockroach and an albino rat. 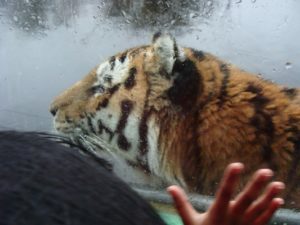 We then explored the rest of the park and had an interesting encounter with a tiger before visiting the tropical house, the giraffes and finally the penguins. We returned to the coach, wet and cold but having enjoyed the experience despite of the inclement weather. In English this week, we have continued with our Goodies vs Baddies unit. This week we have been looking at newspaper reports and articles and analysing their layout and language features. Next week the children will write a report about a superhero dual. In Maths we have been continuing our Statistics unit with analysing and interpreting data using line graphs. Please continue to support the children’s times tables learning, with secure times table knowledge this really supports learning across other units including fractions and multiplication and division. 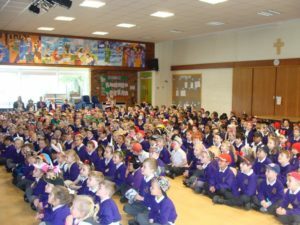 Please continue to encourage your children to take part in the reading challenge; the prize for completing the reading challenge and being drawn from the hat is a trip to Rock Up in Whiteley which the children are very excited about. Next week we will be hearing the children’s poetry performances to vote for the grand final so please continue to support your children with their poem. In English this week, we have continued with our Goodies vs Baddies unit. This week we have been evaluating texts to find features that create atmosphere and tension. We then used these features to help us plan and begin our final drafts. In Maths we have been continuing our Statistics unit with analysing data and transferring it into bar charts, choosing an appropriate scale. We continue this next week by introducing line graphs. Please continue to support the children’s times tables learning, with secure times table knowledge this really supports learning across other units including fractions and multiplication and division. In RE this week, we continue our Revelations unit, the children explored whether you are able to go to Heaven if you have sinned. They came up with some very convincing cases which were supported by their use of scripture. Tuesday afternoon we were investigating artifacts excavated from the site where the new building will stand. After our investigation we found that they were Anglo-Saxon, we hope to learn more about this in the future. We had a lovely time Thursday afternoon, when we all took part in dance activities at Oaklands. Thank you to the year 9 children who taught us new dance routines. With less than two weeks left, continue to support your children with their off by heart poetry. We are all looking forward to hearing their performances. In English this week, we have continued with our Goodies vs Baddies unit. We have been exploring different vocabulary to describe the actions of Peter Pan and Captain Hook. The children became reporters and created their first draft of the action to submit to their ‘Editor’. They were motivated through their drama activities to meet this deadline today. In Maths, we have completed our Fractions unit. Over the unit, the children have been finding unit fractions (1/4, 1/3/, 1/8 etc) of shapes and amounts, non-unit fractions (3/4, 2/5 etc) of shapes and amount, finding equivalent fractions ( e.g ½ = 2/4, 2/6 = 4/12) and applying this fluency to problem solving and reasoning. Your child may need to consolidate some of these objectives further so they can continue to practise fractions as part of their home learning. We began our Statistics unit with analysing data and transferring it into bar charts, choosing an appropriate scale. We continue this next week. In RE this week, we continue our Revelations unit, using what we learnt about the transfiguration last week to create their own prayers to praise God for revealing himself through Jesus and how this is revealed in their lives. Also continue with learning their chosen poem for the performance poetry final in March; we can’t wait to see their performances during the last week of this half term for the children to vote who represents Year 4 in the final. 4B: Hollie King: ‘For using the gifts God has given her to show resilience in her learning and challenge herself. 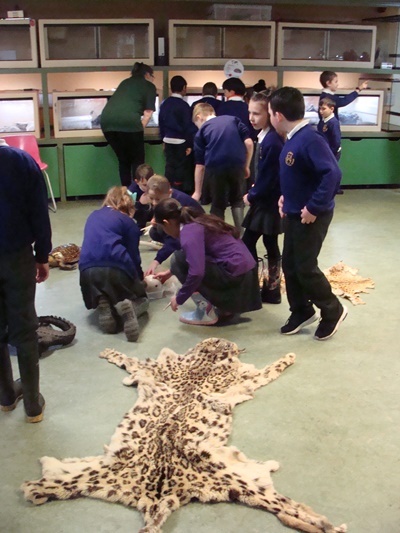 Thank you for the Marwell trip responses, please return permissions slips by Friday 1st February for final arrangements to be made. Many thanks. In English this week, we have continued with our Goodies vs Baddies unit. We have been exploring different vocabulary to describe the actions of Peter Pan and Captain Hook and developing our thesaurus skills. In Maths, we have started our Fractions unit. This week we have been exploring a new fractions problem. To develop our skills we have been learning how to add and subtraction fractions and finding fractions of amounts. In RE this week, to begin our Revelations unit, we have learnt about the transfiguration. We have explored the links between the scripture and art work. We had a visit from, Indie, a guide dog and their trainer on Tuesday. The children found it funny to watch Miss Burch and Miss Stapley order numbers blindfolded, but this showed how difficult simple tasks can be without sight. We had the opportunity to learn about the positive impact a guide dog can have, ask questions and stroke Indie. Please continue to encourage your children to take part in the reading challenge; it has been lovely to see so many already ticking off the books. The children are already enthusiastic about the performance poetry; we can’t wait to see their performances later in the term. Home learning expectations are 10 minutes per day each on a Reading, Spelling and Maths activity. This needs to be written in the home learning diary each day. Thank you for the Marwell trip responses, please ask for a spare letter if you need one. In English this week, we have started our Goodies Vs Baddies unit and have been exploring what makes a good and bad character. We have used drama activities to explore the minds and actions of such characters. The children wrote playscripts with a partner to perform in the roles of Goodies Vs Baddies. We have given out the Spring Reading passport for the children to start to complete and the children also were given a poetry performance booklet to begin to learn a chosen poem off-by-heart. In Maths, we have started our Fractions unit. This week we investigated different problems associated with unit fractions and equivalent fractions. Next week we will be continue to investigate further problem solving activities. In RE this week, following Epiphany, we have looked at the symbols of angels and how angelic behaviour can be seen in people in our own world. A letter about our Marwell trip was sent home on Friday. What a busy week! 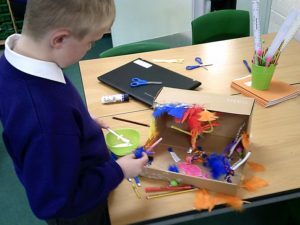 We have been finishing our learning for this half term this week. 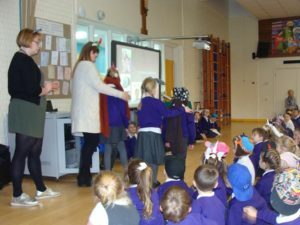 On Wednesday morning the children enjoyed watching and participating in a pantomime. Thursday afternoon we enjoyed a candle lit carol service as a whole school, a lovely way to end the term. 4s – Joshua Hill – for writing an extended piece of writing showing great commitment. 4S – Nicole Chen – For using the gifts God has given her to improve her attitude an commitment to her learning. 4B – Emily Long – For using the gifts god has given her to be a respectful and helpful member of the class. We hope you have a relaxing Christmas break and we look forward to seeing you all in 2019! Proudly powered by WordPress • Theme: Chalkboard by Edward R. Jenkins.